FOX has officially cancelled the Rake TV series. The news comes as no surprise and leaves the dark comedy with one episode unaired. 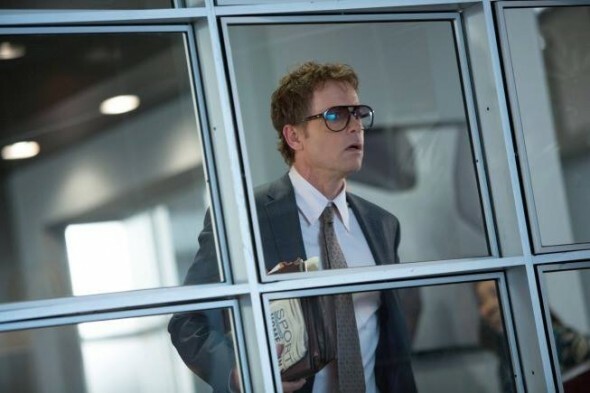 Rake follows a lawyer (Greg Kinnear) who tries to do good but just can’t seem to get beyond his numerous addictions that cause him so much trouble. The cast also includes John Ortiz, Necar Zadegan, Bojana Novakovic, David Harbour, Tara Summers, Miranda Otto, and Ian Colletti. The show got off to a poor start on Thursday, January 23rd, and the ratings dropped lower in subsequent weeks. After seven episodes, the network sent the series to Friday night where the ratings got much worse — even by Friday night standards. FOX aired two more installments on a Saturday night and has yet to release the final episode. What do you think? Do you think this show sould have been cancelled? Are you sorry that there won’t be a second season of Rake? I absolutely loved every episode. Bring it back, I need more. There’s not much on the TV these days that actually keeps me watching, Rake had me glued to my Laptop. The show sounds like an exact copy of an Australian show by the same name, even the discription of the show is identical. The Australian show is great. The show never should have aired, plagerizing pieces of ****, ce up with your own show. BTW, the Australian show is still going strong, check it out. BOYCOTT LOSERS WITH NO IDEAS OF THEIR OWN!! Greg Kinnear was robbed of an Emmy. He was fantastic in this Series. I just discovered the show and I love the fact they outed the legal field with their dirty billing tactics. I wish it wasn’t cancelled. I give the show an 8 but Greg Kinnears performance deserves a 10 because he was outstanding in it. Does not measure up to the Australian original, which is fabulous. Too bad American TV only serves up garbage and horrible re-makes. And networks wonder why audiences are fleeing in droves! such a good show, what the hell is the matter with those fools? are they that out of touch ? Hi All, Just came across this page. The American version of Rake is a copy of the original Australian series – which is avail to you on Netflix for s1 and s2. We have got s4 running here in Australia of the original Aussie version at the moment. If you can get the Aussie version on Netflix or the net, I urge you to check it out. Cleaver Greene rocks! I was shocked it was cancelled. It was very Kinnear-esque. Dry, witty, lovably self-deprecating. This was a winner. Fox blew it. When shows like 2 Broke Girls start killin’ it, I shudder at IQ level of the general NA viewing public. Fox needed to do a way better job of promoting Rake. In my opinion that’s why it failed. Super disappointed when it was canceled. Great show. P.S Fox. At least air the last episode. Loved the show, I am very disappointed.